Operations tested and security approved, the Original SWAT Classic Men's 9in Side-Zip Safety Tactical Boot 119402 delivers the safety and performance features and the all-day comfort you've come to expect from Original SWAT. A convenience side zipper provides easy entry and removal in the field. A lightweight safety toe protects your toes from falling hazards. 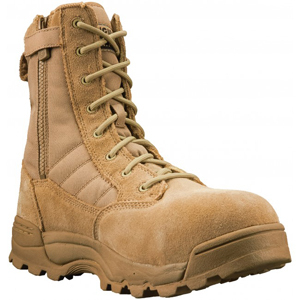 Easily maintainable suede leather and Cordura 1000 denier nylon make this boot one of the lighter models on the market. It includes a moisture-wicking lining with AEGIS antimicrobial protection and unlined upper to keep your feet cool and dry.